The Galley Head Lighthouse was built in 1875 is perched on cliffs 133 ft above the sea. 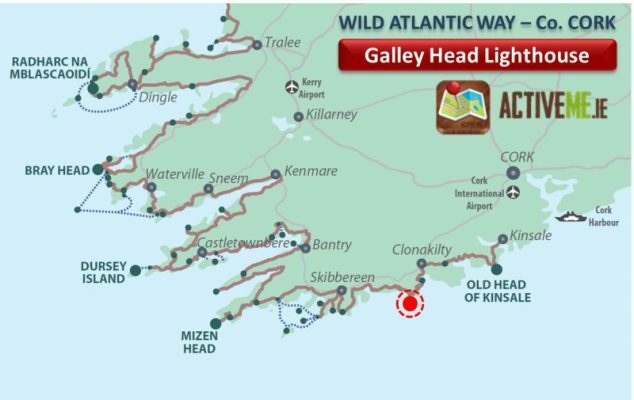 Located near Rosscarbery, Co. Cork in the south west of Ireland, it is a discovery point on the Wild Atlantic Way with beautiful views from every angle. At 69ft high and with a range of 23 nautical miles (43 km or 26 mi) the Galley Head lighthouse along with the Fastnet lighthouse have the distinction of being two of the most powerful lighthouses in Europe. The lighthouse is located on a headland known as Dundeady island above Red strand beach to the east and the Long Strand to the west. The headland is actually cut off from the mainland by ancient walls of an old Norman fort of Dun Deidi, an important fortress of the local O’Cowhig Clan. A sobering thought is that the Lightkeepers living here in 1915 would have witnessed the sinking of the Lusitania where 1,198 passengers and crew lost their lives.